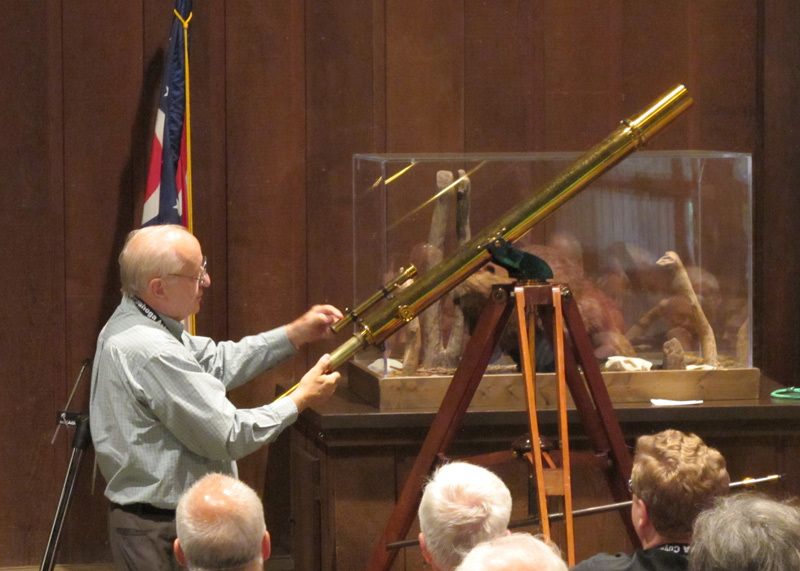 Among the member-owned telescopes shown and discussed at the June 8, 2015 meeting was a lovely antique refracting telescope. The ca. 1900 Broadhurst, Clarkson & Co. instrument was made in London. CAA member Steve discovered the scope while visiting England, purchased it, and shipped it home. The brass beauty needed no refurbishment by its new owner and sits atop a tall, wooden tripod with a unique mount. Steve told the audience the telescope was built to be used for both terrestrial and celestial observing. Interestingly, however, when the scope is arranged to view distant objects on land or sea, the user would likely need a step stool to reach the eyepiece! This entry was posted in Uncategorized and tagged antique, Meeting, vintage telescope. Bookmark the permalink.